One of the biggest critiques of the U.S. immigration system is that there are very few options available to foreign nationals that create a direct path to permanent residency. Indeed, this is a very cruel reality for our clients. A reality that we struggle to overcome on a day to day basis. More often than not we speak to clients who simply cannot immigrate to the United States because of our antiquated immigration laws. If you are the immediate relative of a U.S. Citizen your relative can file Form I-130 Petition for Alien Relative on your behalf, which will allow you to file the I-485 application for Permanent Residence. Immediate relatives of U.S. Citizens include spouses, unmarried children under the age of 21 of a U.S. Citizen, and parents of U.S. Citizens 21 years of age or older. Immediate relatives of U.S. Citizens DO NOT have to wait in line for a visa number to become available to them in order to immigrate to the United States. If you are the family member of a U.S. Citizen and you fall under a qualifying “preference category,” your U.S. Citizen relative may file the I-130 Petition on your behalf. Family members of U.S. Citizens that fall into a “preference category” include: unmarried sons or daughters over the age of 21, married children of any age, and brothers and sisters of U.S. Citizen petitioners 21 years of age or older. Immigrant visa numbers for these individuals are limited and are therefore subject to a waiting period. You must wait for your priority date to become current on the Visa Bulletin, based on your preference category and country of charge ability, before you are eligible to either apply for adjustment of status in the United states, or apply for an immigrant visa at a U.S. Consular post abroad (if you reside overseas). If you are the spouse or unmarried child of a green card holder your relative may file Form I-130 petition on your behalf. You must wait for your priority date to become current according to the Visa Bulletin before applying for permanent residence. There are ‘special’ categories that may allow you to seek permanent residence. Members of special categories include: battered spouses and their children (I-360 VAWA Recipients), K nonimmigrants (fiancées, K-3 spouses of U.S. Citizens), children born to foreign diplomats in the United States, V nonimmigrants, widow(ers) of U.S. Citizens, Winners of the Diversity Immigrant Visa Lottery, certain U visa recipients, Asylees, and Refugees. To discuss other special categories please contact our office. If you do not have a qualifying relationship to a U.S. Citizen or Legal Permanent Resident, the most common way for you to gain permanent residence is by securing employment with a U.S. company willing to sponsor your permanent residence. Your employer must file the I-140 Immigrant Petition for Alien Worker on your behalf, before you are eligible to apply for permanent residence. Under the Immigration and Nationality Act, employment-based immigrant visas are subject to annual quotas. 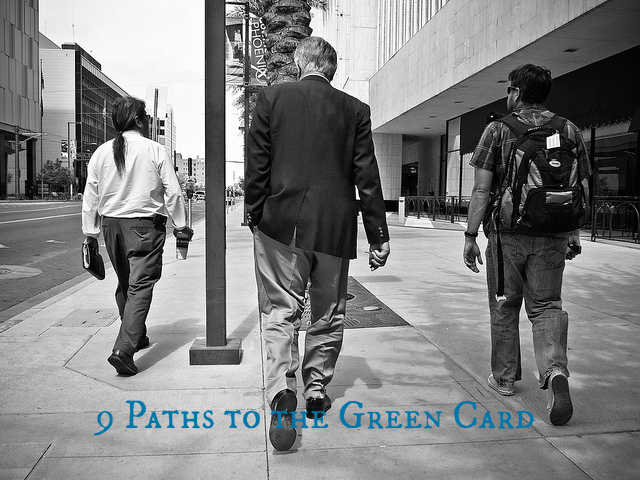 Many professionals, skilled workers, entrepreneurs, and persons with advanced degrees, first enter the United States with a nonimmigrant visa (such as a F-1, H-1B, E, O-1, L-1) and then have the opportunity to market themselves to a U.S. employer willing to employ and later sponsor their permanent residence in the United States. Some are lucky enough to find love during their immigration journey and are able to gain permanent residence based on their marriage to a U.S. Citizen. Here at the Law Offices of Jacob Sapochnick we understand how elusive the path to permanent residence is. You don’t need to walk that path alone. Contact our office to help you navigate your immigration options. For more information on these family and employment visas please click here.